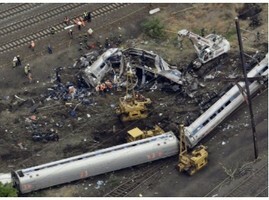 NEW YORK, May 15, 2015 /PRNewswire/ -- The Law Firm of Ronai & Ronai, LLP, has been retained by a seriously injured victim of the Philadelphia train derailment, which involved Amtrak Northeast Regional Train 188 enroute from Washington D.C. to New York City on May 12, 2015, and are presently consulting other victims of the tragedy. The victim (name withheld at his request), who was on the Amtrak train operated by train engineer Brandon Bostian, was severely injured when the train derailed in Philadelphia, killing at least eight people and injuring more than 200 others. The National Transportation Safety Board has confirmed that the train was traveling at 106 mph shortly before the crash and was operating at twice the speed limit while on a curved part of the track. Ronai & Ronai, LLP also presently represents a seriously injured victim of the MTA train derailment which occurred on December 1, 2013, in the Bronx, New York and in which 4 people were killed and more than 70 injured. Ronai & Ronai, LLP also represented the families of the two Hungarian students who tragically drowned to death in the Duck Boat incident which occurred in 2010 on the Delaware River in Philadelphia. Holly Ostrov Ronai, Esq. stated that "This incident is reminiscent of the MTA derailment of December 1, 2013. It is clear that since that incident, absolutely nothing has changed regarding having fail safes implemented to prevent this type of occurrence and effectively prohibit human error and/or recklessness. This is simply inconceivable considering how many people use mass transit - particularly trains - every single day." Peter Ronai, Esq. joined in that statement and added, "This is even more egregious than the MTA derailment as this one involves AMTRAK, which has been deemed a government agency. As such, they should be held to an even higher standard and held even more accountable, so that no more lives will be lost." Those injured in the derailment are seeking the truth about what happened and are hoping that the reason for this tragedy, and how it might have been prevented, will all be revealed during litigation. Further, they want all those responsible to be held accountable, so that an incident such as this never occurs again.